Surface Winding Slitting Machine Video(FSL-BT) - HCI Converting Equipment Co., Ltd.
For slitting thin and slip plastic films of uniform thickness. 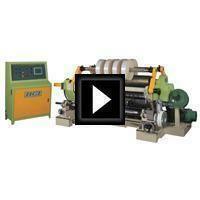 For surface winding laminating paper, aluminum foil, stretch film, isolated paper, labels, and other paper rolls. For slitting electronics, computer and optical materials, film roll and foil roll.